Vintage frazada wool blanket from the highlands of Peru. Hand-woven wool fabric from antique Highland Peruvian "manta". One of a kind pillow designed and constructed in United States with antique Peruvian fabric. 18" x 18" pillow with canvas backing. 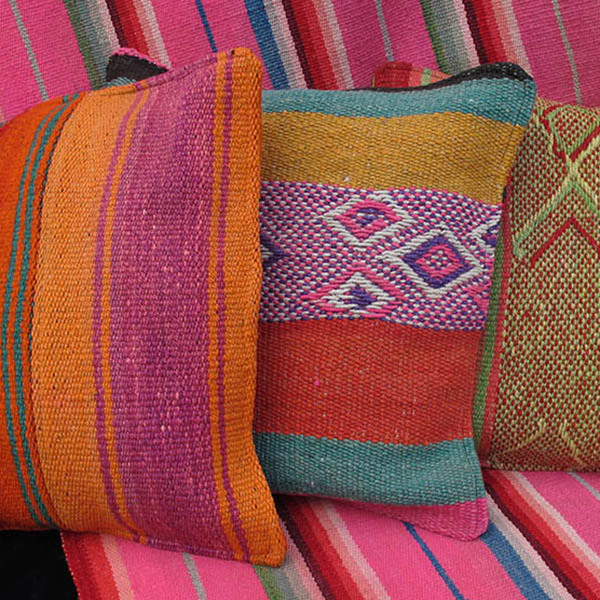 18" x 18" pillows made from vintage heavy wool "Frazada" blankets from the highlands of Peru. Sold assorted. Colors and designs will vary. Only one pillow left. On Sale!